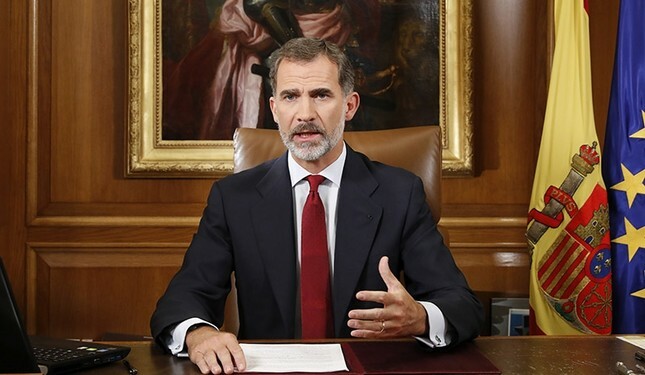 Spain's King Felipe VI said Tuesday that Catalan authorities have deliberately bent the law with "irresponsible conduct" and that the Spanish state needs to ensure constitutional order and the rule of law in Catalonia. Delivering an address to the nation by television, the king said that the bid by authorities in the northeastern region to push ahead with independence has "undermined coexistence" in Catalonia. "Today, Catalan society is fractured and confronted," Felipe said, referring to the political crisis as "very serious moments for our democratic life." He said that the state needs to ensure Spain's constitutional order and the correct functioning of Catalan institutions and rule of law. Spain's conservative government has said it will respond with "all necessary measures" to counter the Catalan defiance, and is holding talks with national opposition leaders to find multi-partisan consensus on the response, which could include suspending the region's self-government.